Nizhny Novgorod (be careful not to mix with Veliky Novgorod) was called ‘Gorky’ during Soviet times, or simply Nizhny or NiNo by locals. It is considered Russia’s third capital due to its historic importance as a merchant town, beautiful nature, industry and population. A short train ride from Moscow, it was here where, in merchant times, Kuzma Minin and Count Dmitry Pozharsky rallied a popular army to fight against Polish intervention in 1612. Today the two men are commemorated in a monument in front of Moscow’s St Basil’s Cathedral. 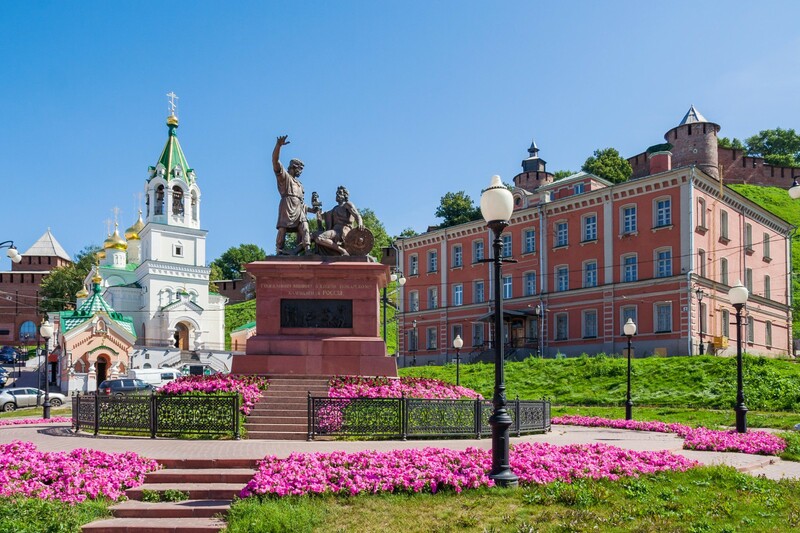 Another gem on the River Volga, Nizhny Novgorod is simply spectacular, with its upper town on a hill overlooking the confluence of the Volga and Oka rivers, providing a stunning view of the new stadium. With a history as a major river port and the venue of Russia’s biggest market fair, and one of Europe’s largest, during Soviet times the city had to be closed to foreigners due to strategic military enterprises, and so limiting migration or tourism. Nizhny Novgorod is separated into two parts by the river; an upper town hosting all major attractions and historic sights and the lower town with the railway station, the historic market fair and the new stadium. The city can give any tourist a hard time, with part of the city high on the hill and separated from the renovated river bank by some 400 steps. You can only reach lower town by public transport or taxis. The most pleasant areas to visit include the city’s Kremlin fortress, providing a stunning view of the lower town and new stadium. The pedestrianised Bolshaya Pokrovskaya street features plenty of places to eat and small monuments. Going down the stairs, don’t miss Rozhdestvenskaya street with plenty of bars and cultural spaces as well as the newly renovated Volga embankment, NIzhnevolzhskaya naberezhnaya. In the lower town where the stadium is located, Meschera lake is a popular spot during the summer. Sakharov Museum was founded in memory of the Soviet nuclear physicist Andrei Dmitrievich Sakharov in a small apartment at prospect Gagarina, 214 outside the city center where the scientist lived during his political exile. Sakharov was known as the father of the Hydrogen Bomb, however in 1975 he was awarded the Nobel Peace Prize for his humanitarian work. The Fan Fest in Nizhny Novgorod is located on Minina i Pozharskogo Square next to the popular Chkalov monument and Kremlin fortress. This fan party will be hard to miss due to its central location and good transport links from Nizhny Novgorod’s main station. While the upper town and areas around the stadium, Meshchera lake and historic fair are quite safe, locals advise avoiding Sormovskiy and Avtozavodskoy districts in the lower town. The city is not used to much ethnic diversity and local visible ethnic minorities have mentioned the increased attention they are getting on the streets or public transport. During the World Cup the atmosphere should be much more welcoming. Small homophobic groups are active in the city so any LGBT+ fans are advised to exercise caution displaying any symbols or affection in public outside the stadium or official Fan Fest. In 2016 a camping event on the river next to Nizhny Novgorod organised by the Russian LGBT Sport Federation was violently attacked by a group of assailants chanting homophobic slogans. Many participants sustained serious injuries and their cars were damaged. Since the 1990s Nizhny Novgorod has had quite a typical population mix in terms of ethnicity, with Tatars and Mordvins representing the biggest ethnic minority groups and a number of smaller minority communities including the recent influx of Central Asian labour migrants. Nizhny Novgorod medical university attracts several hundred students from Morocco, India, Pakistan as well as other African and Arab countries. In the recent past several cases of harassment and physical attacks were reported by minorities in and around Nizhny Novgorod. Much of the violence is directed against Central Asians or people from the Caucasus. Due to its proximity to Moscow the civil society scene in Nizhny Novgorod has been very active, especially before the ‘Foreign Agent’ legislation was passed in 2012. The ‘Committee against torture’ human rights NGO is active in defending the rights of citizens abused by the police. One of the few organisations to survive the ‘Foreign Agent’ laws and even win ‘Presidential grants’ funding is the Volga Migration Centre. It was created in 1998 and aims to protect the rights of migrants and assist those who have settled in Nizhny Novgorod. The organisation offers help and support and Russian language classes. The Centre has also developed a specific hotline for migrant women who find themselves in difficult situations. Apart from not-for profit activities, the centre also provides commercial services to migrants helping to obtain work permits and other necessary documents. The city has an active feminist group and shelter for women victims of domestic violence and an active anti-fascist scene. The LGBT+ movement is very active in Nizhny Novgorod with branches of both LGBT Network and Russian LGBT Sport Federation maintaining a community center and organizing public educational activities. In recent years due to the overall homophobic climate and increased threat of attacks, most activities are not public and the address of the community center is not published. You can hear the story of two Nizhny Novgorod LGBT+ activists visiting a Pride parade in Madrid in 2017 in a new documentary by acclaimed Spanish director Fernando González Molina in ‘The best day of my life’. The football history of the city is quite patchy with little national success since the game became popular at the beginning of the 20th century, unlike the city’s ice hockey club Torpedo which is popular. The only professional football team in Nizhny Novogorod now is ‘Olimpiyec’, playing in the second division.